Religion doesn’t only exist in church; it also exists in these ancient caves. They hold the key to powerful dynasties in such an extraordinary way, standing in their presence automatically transports you to the past. The next five caves are more than centuries-old rocks made of limestone and shifts in the earth, they are shrines filled with deities and murals that represent the craftsmanship and dedication taken to produce their rocky architectural feats. If you are looking to add a bit of mystery to your travels then take a step into these mystical caves. When it comes to shrines, the Ajanta Caves arenot only revered but an architectural wonder concealed in a labyrinth of underground caves. A total of 29 Buddhist sanctuaries were created by monks, giving visitors a a front row view of their religious traditions. Each cave is like stumbling onto a new treasure, especially since the walls, ceilings and floors are covered by various depictions of the god and murals. 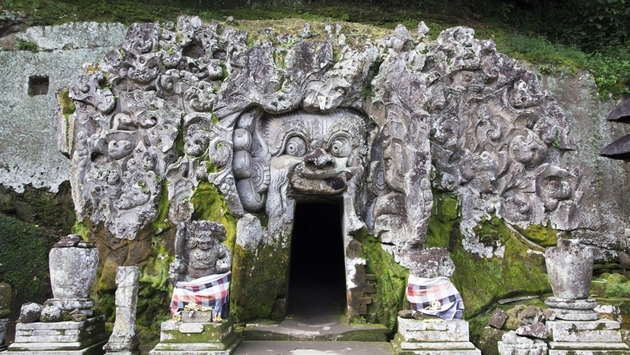 Seemingly created as a tactic to scare intruders away, the intimidating creatures etched onto the mouth of the Goa Gajah areas chilling as they are breathtaking. They signal that this may be the home to some supernatural being, and whoever he is he has exquisite taste. China’s landscape comes to life with relics from the past and so it comes as no surprise that the Yungang Grottoes would be another testament of its rich heritage. Along the side of a mountain tens of thousands of ancient Buddhas in various poses and styles gleam in antiquity. One of its most dominant attractions is the 14 meter deity of Cave 20, which dates back to 465 AD. The Royston Cave was discovered in 1742, and believed to a secret sanctuary for a member of the Knights Templar who disgracefully lost his army when accusations of heresy started to spiral. Inside the cave are intricate carvings that embody his religious beliefs such as portraits of the holy family. When a group of teenagers stumbled onto the Lascaux Caves, they had no idea that this underground world would birth a new discovery. Although who or what may have decorated their walls remain a mystery, what remains pretty clear is that the many animals and symbols engraved throughout the complex of cave provides indication of France’s Paleolithic past. The country is rich with art, but the Lascaux caves display such fine paintings a replica was made to preserve its artistic beauty.